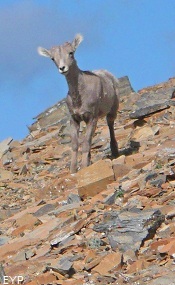 We enjoyed this Bighorn Lamb and his mother on Dawson Pass. 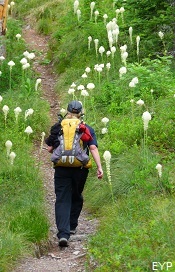 There is plenty of Bear Grass along the trail when the season is right. 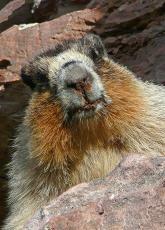 You will meet the infamous Dawson Pass Marmot. He's not shy- so watch your backpacks! 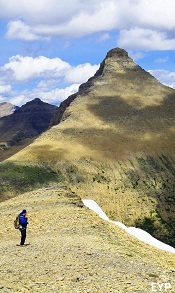 Flinsch Peak rises directly to the North of Dawson Pass. 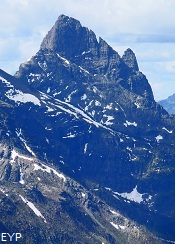 This is one of the many matterhorns found in Glacier. Hopefully you'll get to see a black bear along the trail. The boat shaves off quite a few miles, but it leaves late and stops early. The Nyack Valley runs north and south just below the pass to the west. 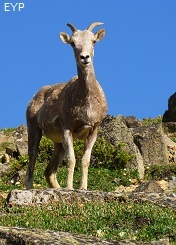 It is one of the most remote areas in the park. 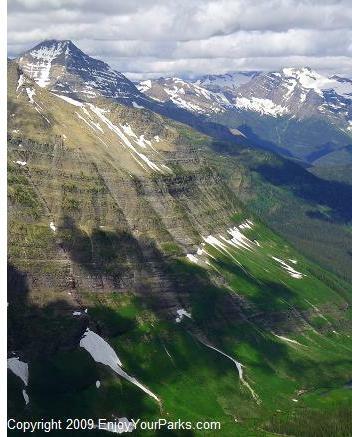 Dawson Pass in Glacier National Park is breathtaking! Dawson Pass is located on the Continental Divide in the the Two Medicine Area, and it is one of the most scenic passes in Glacier National Park. 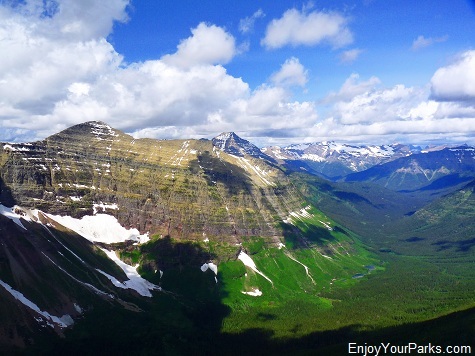 It's not an easy hike, but the rewards are well worth the effort. 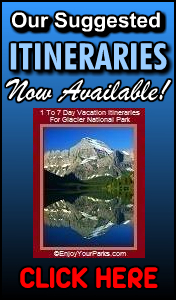 You will see gigantic mountain peaks as far as the eye can see, glaciers, lakes and bighorn sheep. 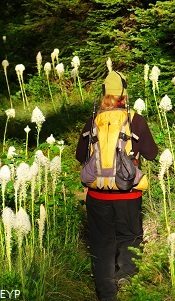 Dawson Pass is truly a hike worth considering if you are in good physical condition. 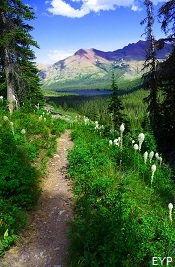 NOTE: If you'd like to continue on from Dawson Pass, there is a wonderful 17 mile loop that will take you back down to the Two Medicine Campground called the Dawson-Pitamakan Loop. 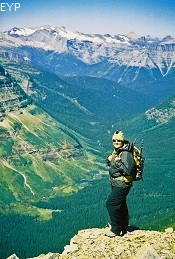 This is one of the premiere day hikes in Glacier National Park. For more information click here. 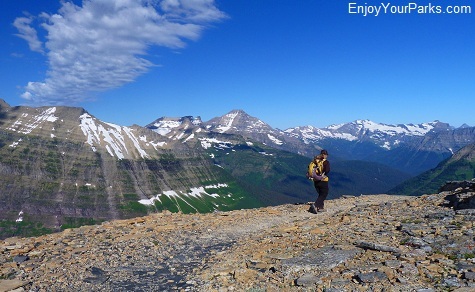 Dawson Pass in Glacier National Park provides gorgeous views in all directions. 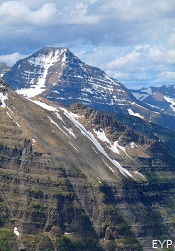 This is a view of Two Medicine Lake and Rising Wolf Mountain from Dawson Pass in Glacier National Park. The close end of the lake is where your boat will pick you up to take you back to your car. There are two ways to get to Dawson Pass. 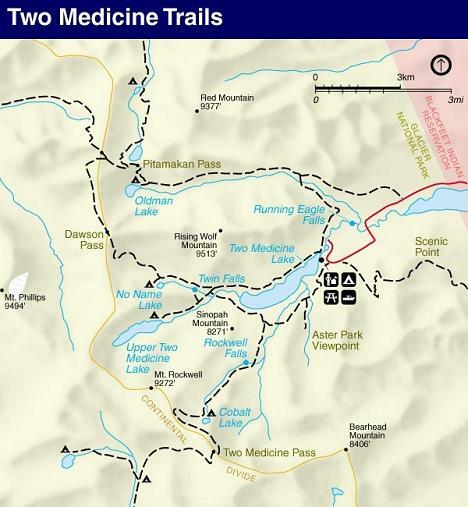 One is the North Shore Trailhead located in the Two Medicine Campground. 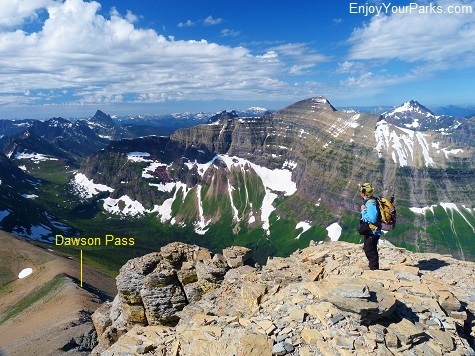 The distance to Dawson Pass from here is 6.7 miles with a vertical elevation gain of 2,450 feet. 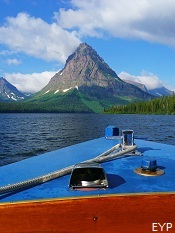 The other way is take the Two Medicine Boat across Two Medicine Lake and take the trail from the upper boat dock. 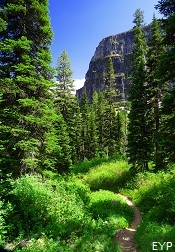 This trail connects with the Dawson Pass Trail. 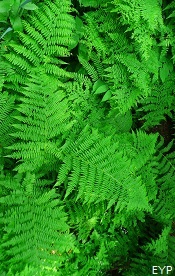 Be alert for signs- they are easy to follow but if you are not paying attention along the trail, you could miss one. The boat shaves off about 3 miles (one way!) so it really makes for an easier day. The only downside is that the boat leaves for the upper boat dock at 9 AM, last boat of the day picks hikers up at the upper boat dock at 5 PM to take you back to the Two Medicine parking lot, so you don't have a lot of time to enjoy the pass. 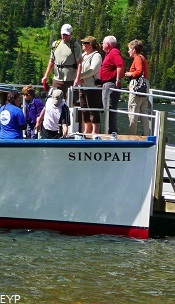 Yet another option is to take the Two Medicine morning boat, and then walk back on the North Shore Trail. This way you don't have a schedule. However, you are walking an extra 4 miles because it's three miles around the lake, and then once you reach the trailhead at the campground, if you parked your car at the boat parking lot, it's another mile back to your car. 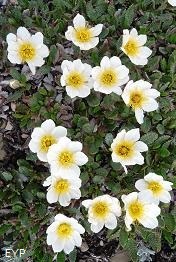 (We do a lot of mountain climbing in the Two Medicine Area, and we wish there was an earlier climber's boat, and a later pick-up. That way climbers and hikers could utilize the boat more. We can rarely use the boat because it leaves too late and comes back too early.) 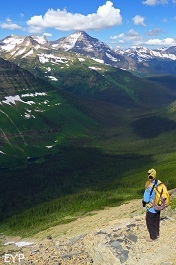 But however you get there, Dawson Pass in Glacier National Park is magnificent, and it's worth the effort. As you walk along the North Shore Trail, you will wrap around the base of the gigantic Rising Wolf Mountain that towers above you at 9,513 feet. This part of the hike is basically flat. 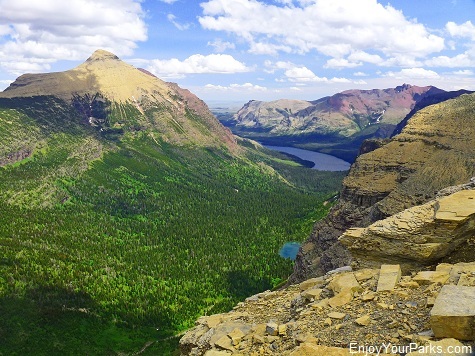 The next part of the hike, once you get past Two Medicine Lake, begins to climb, and the steep hiking begins two miles before the Pass, which is 1,200 feet of steady climbing. 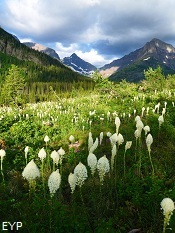 Once you reach Dawson Pass, you will want to grab your camera. 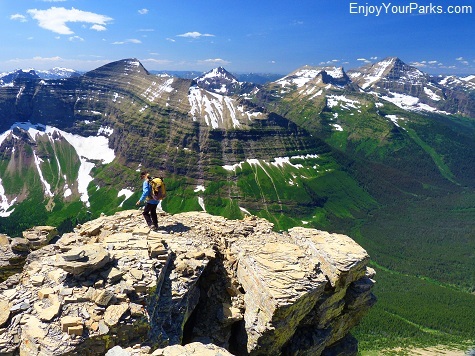 The view is absolutely spectacular, and you will immediately forget how tired you might be from the hike! Directly in front of you (straight west) is Mount Phillips with Lupfer Glacier clinging to is east face, and just north of Phillips is the monstrous Mount Stimson, one of 6 peaks in the park over 10,000 feet in elevation. 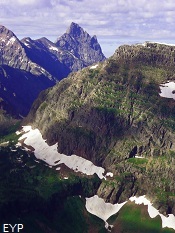 North of Stimson is Mount Jackson and the glacial complex that surrounds it's southern slopes. The huge valley directly to the west of Dawson Pass that runs north and south is the famous Nyack Valley with Nyack Creek running through it. 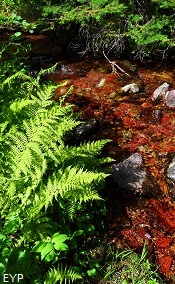 This is one of the most remote areas in the park- very few people ever get into the Nyack. The sharp matterhorn that rises up from the pass to the north is Flinsch Peak, and the mountain than runs from the pass to the south is Mount Helen. 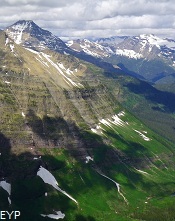 The sharp peak to the far south is Mount St. Nicholas, which is one of the most technically challenging peaks in Glacier National Park. This is a view from the summit of Flinsch Peak. 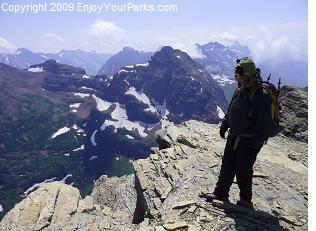 Note Dawson Pass far below to the south of this incredible Glacier Park matterhorn. If you want to be really adventurous, and you are in proper physical condition, you can literally walk up the ridge to the south of Dawson Pass and it will take you to the summit of Mount Helen (8,538 feet). This hike requires no technical skills whatsoever, and the view from Mount Helen is so beautiful it's difficult to describe. 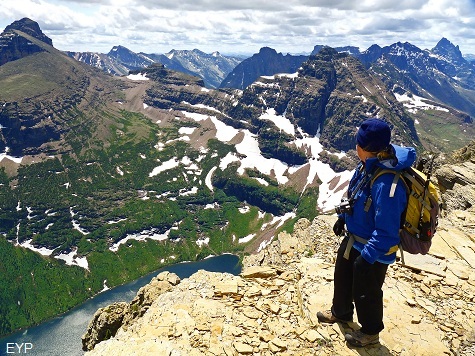 So it you've ever wanted to climb a peak in Glacier National Park, this is definitely a good one because it's just a hike, and the view is awe-inspiring! 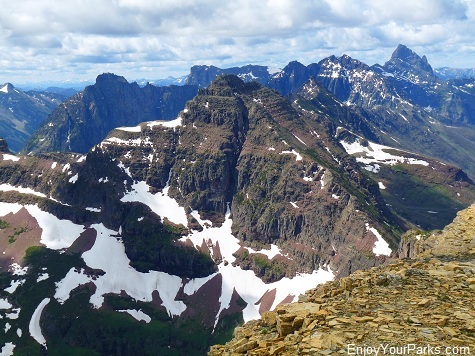 This is a view from the summit of Mount Helen in Glacier National Park. 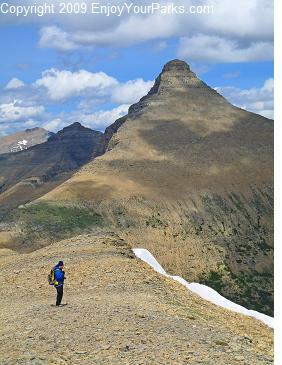 This peak is a simple walk up from Dawson Pass, and is very much worth the effort! If you are taking the North Shore Trail along Two Medicine Lake, leave early! We recommend just after the sun rises. This will allow you to take your time, rest, and have plenty of time to enjoy the pass and Mount Helen if you choose to do so. 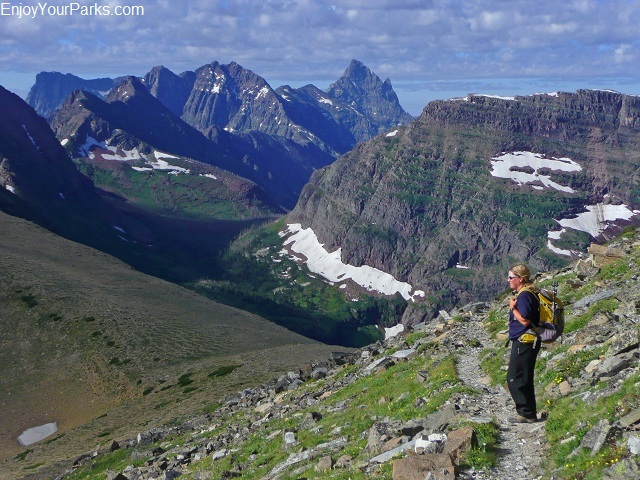 Check out our Ultimate Checklist for everything you'll need for the Dawson Pass hike, as well as our Suggest Itineraries for your Glacier National Park Vacation. 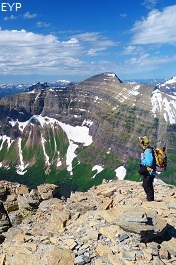 This is a view from the summit of Flinsch Peak (facing west). 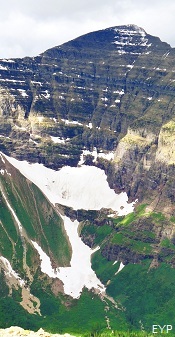 Flinsch rises directly above Dawson Pass to the north. 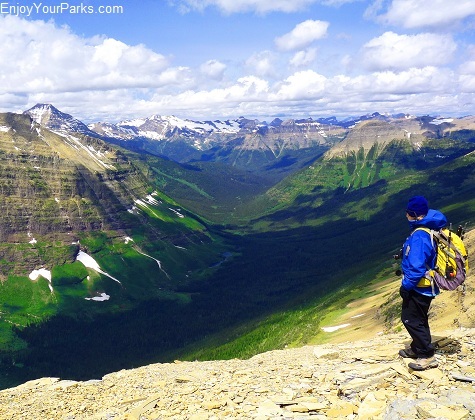 If you'd like to see more "views from the summits" in Glacier Park, click here. 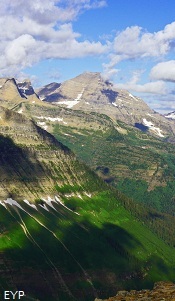 This is the northwest view from Dawson Pass in Glacier National Park. 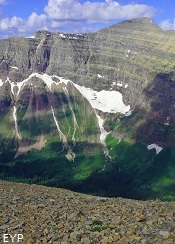 This is a view from the summit of Mount Helen near Dawson Pass in Glacier National Park. Upper Two Medicine Lake is thousands of feet below us. 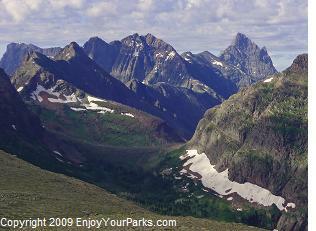 You will see the magnificent Mount Stimson from Dawson Pass. 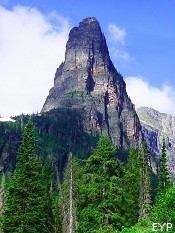 It is one of the six peaks over ten thousand feet high in the Park. The view from Dawson Pass is breathtaking! This famous peak that you will see to the south is Mount Saint Nicholas. It is the most technically challenging peak to climb in the park. 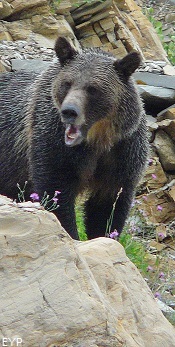 Grizzly Bears like to get above the pass and get in the rocks to do their "mothing" during the month of August. Keep an eye out- they'll show up in very unexpected places. 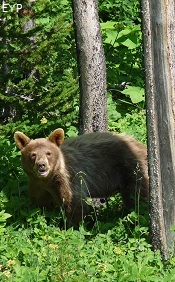 In fact, we met a sow and cub Grizzly on the summit of Rising Wolf Mountain, which is just to the east of Flinsch Peak. 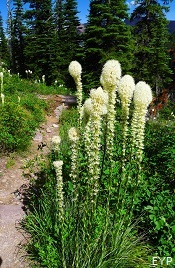 You'll also see Mount Phillips once you get to the pass. Lupfer Glacier is the large ice mass that you see on it's east face. It's much, much larger than it appears from the pass. This sharply pointed structure is known as Pumpelly Pillar. You'll walk right by it on the way to the pass. 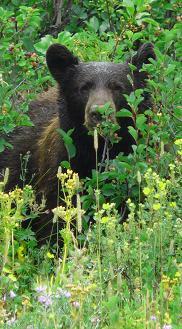 During the berry season, there are a fair amount of black bear along the trail. 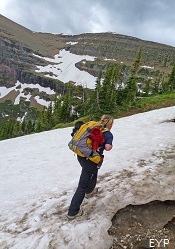 During the final mile of your hike, you may have some snow fields to navigate through early in the season.